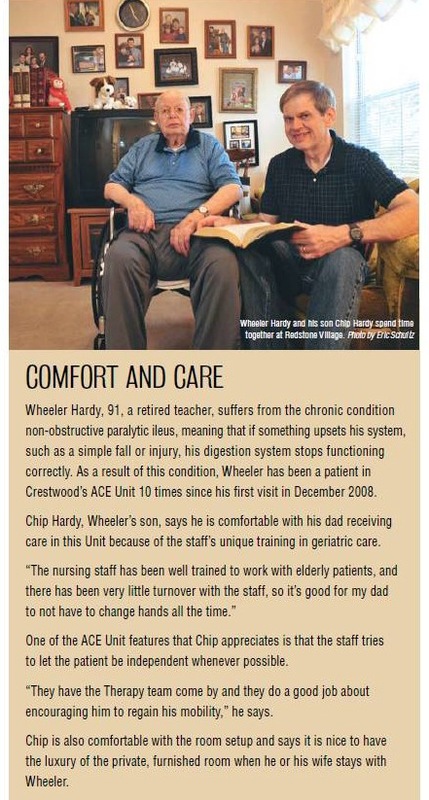 The Acute Care for Elderly unit is a unique model of care for older adults. Research has shown that even when the acute diagnosis ( such as pneumonia) is cured or the surgery was perfect, the patient may develop loss of function. 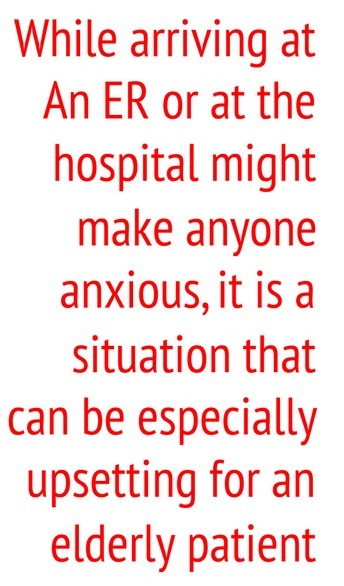 The hospital environment and the processess of care result in multiple complications. The consequences of individual interactions between the effects of the aging process, the acute illness and the hospitalization interact to produce additional disability in the cascade towards dysfunction and the final pathway to dependency and the common pathway to the nursing home. NICHE ( Nurses improving Care for Healthsystem Elders ) is the leading nurse driven program based in New York College of Nursing and helps establish and introduce evidence based practice of medicine for hospitalized older adults in the ACE unit. The NICHE Center houses the resources and tools needed to improve quality of care, and training nurses and interdisciplinary team members to specialize in sensitive and exemplary care for the frail older adults. An acute illness inflicting an older adult, compromised by the aging process and burdened with chronic illness is a vulnerable individual and needs evidence based care when hospitalized. The staff at the ACE unit identify the risk factors at admission and a interdisciplinary team with shared objectives target these risk factors in order to preserve and restore physical and mental function. The result is that ACE unit patients are less likely to be discharged to a nursing home. How does an ACE unit differ from a recent Medical unit. ACE unit addresses problems unique to an older adult, identifies them and takes action through its team. ACE unit personnel are trained to take care of patients who are unable to communicate their needs. ACE unit identifies and treats acute delirium in the elderly, that is present in 30 to 60 % of hospitalized patients above the age of 65. 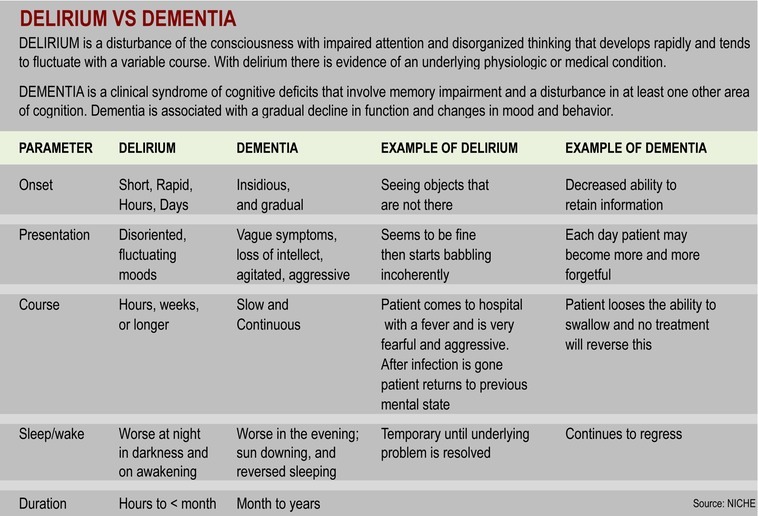 Delirium in elderly adults: diagnosis. prevention and management.
" ghosts" that surround the geriatric patient. The ACE unit can be a dedicated unit to train the geriatric work force of the future and a model for interdisciplinary care and be an example for replication. 2. If ACE units are so great, why aren’t they everywhere? “Coming to the hospital is stressing enough.” Says Tammy Hill, nursing manager of Crestwood’s Acute Care for the Elderly (ACE) Unit. “But imagine having your eyeglasses taken away so you cannot see. If you were brought in through the emergency room, you may not be wearing your dentures, so you cannot eat or speak clearly. Medical tests, x-rays, MRIs, etc., often require removing aesthetic items like jewelry and makeup, stripping you of things that are familiar and that offer comfort and security. Even the height of the hospital bed and being asked to take the pills can be confusing. ”According to Hill over 30 percent of the elderly patients admitted to the hospital in a heighted state of anxiety.“ In most hospitals, the staff is not trained to recognize the traumatic effect these thing have on an aging patient,” She says. “Many times, rather than suffering from what family members think is dementia, they are actually experiencing delirium.” In an effort to provide elderly patients with the highest level of care, Crestwood Medical Center has opened an innovative new Acute Care for the Elderly (ACE) Unit. ACE promises to change how patients over the age of 65 experience health-care at Crestwood Medical Center by taking a completely different approach to treating and diagnosing these patients when they come into the emergency room or enter the hospital. In 2009, Dr. Zaheer Khan, board certified Gerontologist, pioneered the ACE Unit and became its Medical Director. ACE fills a void in specialized multidisciplinary elderly care in North Alabama by building upon progressive concepts put forth by the Hartford Institute for Geriatric Nursing’s NICHE (Nurses Improving Care for Healthsystem Elders) Network at New York University’s College for Nursing. Crestwood’s ACE is one of only three NICHE trained and certified in the state. 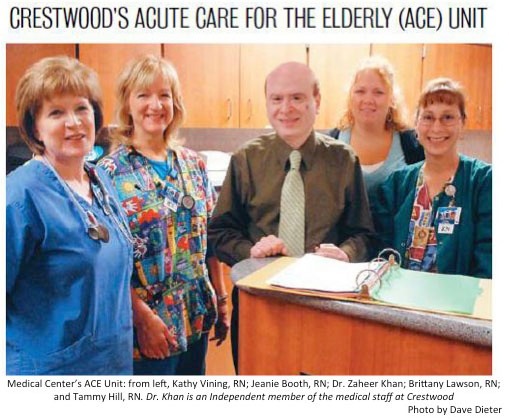 Training is the key to Crestwood Medical Center’s successful NICHE-certified ACE Unit. According to Hill, the ACE Unit encourages nurses, doctors, and medical technicians throughout the Crestwood facility to apply for their NICHE certification and attend ACE training classes. The center distributes a Geriatric Institutional Assessment Profile (GIAP) survey to all medical personnel to assess attitudes and best practices concerning elder patient care, and to evaluate the staff’s existing knowledge concerning geriatric syndromes and institutional guidelines for elderly care. Because there can be a social stigma attached to working with the elderly, Hill says extensive training in that area helps break down barriers and misconceptions some medical professionals may have about working in a geriatric ward. The ACE Unit is currently comprised of 12 beds utilizing space on the 3rd floor, but the ACE team has big aspirations for its continued growth. They meet every two weeks to discuss how they can expand in terms of personnel, equipment, and beds; how to continually improve on specialized elder care; and how to share their professional experiences among other ACE team members.